Organic Kartoffelpuffer and Home-grown Winter Salad a delicious and inexpensive gluten-free lunch or supper dish. When I was a child one of our favourite Winter supper dishes was poached egg with potato cakes. Later on when I lived abroad, I discovered a variation on this theme, which has also become a staple, German potato pancakes. Unlike the English version, which are made from mashed potatoes and then baked, kartoffelpuffer are made from grated potatoes and then shallow fried. For my salad I am using the green leaf vegetables I have growing in the greenhouse; ruby chard, cabbage, oak leaf lettuce and Chinese leaf. I'm only picking them off a leaf at a time and eating them at the 'baby' leaf stage. This has allowed me to continue these plants through from mid Summer to Spring. As a general guide you will need to allow one large potato and one small onion and half a beaten egg per person. The salad is dressed with a simple vinaigrette of unpasteurised apple cider vinegar, olive oil and home-grown garlic. I also add anything else on hand, a couple of endive given to me by a fellow organic gardener and a purchased tangerine. Peel and grate the potatoes and onions with a coarse grater. Using a large sieve held at an angle, over a bowl, squeeze handfuls of the grated vegetables to express the juice. The angle allows you to keep the potato mix draining, whilst squeezing further handfuls. Many people use a glass cloth or tea towel to do this but personally I find it less work to do it this way. Once you have finished, allow the liquid in the bowl to stand until you see the starch separating from it and sinking to the bottom of the bowl. Pour the liquid from the starch. Discard the liquid and add the grated vegetables to the starch in the bowl. 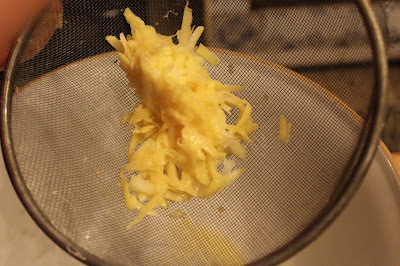 For this mix, which is enough for two, I use one small bantam egg. My chicks lay eggs in all different sizes, so if the amount is crucial to a recipe, I weigh them. Season with salt and pepper and incorporate with the egg and grated vegetable. Meanwhile heat a large frying pan with a oil suitable for frying, just a thin layer. When the oil is hot enough so it sizzles when you add a test piece of potato, spoon in a tablespoon of the mix and flatten down with the back of the spoon. I like the pancakes very thin, that way they become very crisp and complement the salad really well. Flip the pancakes over, to cook on the other side, when they are golden brown, after approximately 4 minutes of cooking. Wash any dust from the salad leaves, spin off excess water and add the vinaigrette. There is something so satisfying about being able to provide fresh, green leaves for the table in Winter. A quick, delicious, organic and gluten-free meal, which can also double as a pudding, when served with apple sauce and sprinkled with a little sugar and cinnamon. At one large potato per person you will get two large pancakes, so enough for a main course and a sweet! The dish below is a Summer version, with garden vegetables, nasturtium flowers and figs and purchased organic ham. GARDENING TIP - Last year we had the best garlic harvest ever through following the traditional French way of planting them on the shortest day and harvesting on the longest. I then dried them in the spare bedroom on a wooden clothes dryer, after having lifted them with their stalks still and dried them initially in the greenhouse. Please feel free to share this recipe and comment or ask questions. Thanks for dropping by and hope to see you again, Sue. Hello Sue, the potato cake look super delicious! You are perfect . I like to eat them with apple compote. I like your blog!